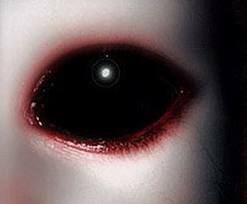 MORE BLACK EYED BEINGS – PERSONAL SPACE INVADERS! “My husband, and our two-year-old son and I went to a used bookstore about two hours from our house in Tucson, Arizona this last Saturday (04/23/2011.) I followed my son as we walked back into the children’s area. He rounded the corner to the aisle with the books. I saw a girl stand, not moving, a little ways down the aisle staring in our direction. Then my husband walked up to us. As he came closer, she did as well, following behind him. My son ran off toward a table and my husband followed. The girl walked up and got right next to me within inches, almost touching. I started to feel extremely uneasy and moved away to where my husband and son stood at the table. They were both looking down at a Mickey Mouse doll which I tried to talk to my son about. As I was looking down, I saw movement coming up behind me out of the corner of my eye. It was the girl. I noticed her clothing looked from about the 1960s and she looked very out of place. She was also overdressed with multiple coats on in a normal temperature environment. She walked in a circling pattern, with her head down in a predatory way, the way a panther stalks its prey. As I stared at her while, she walked slowly. I distinctly remember she did not make a sound when she moved. Which now I am thinking was odd, because she had a lot of clothing on and a bag with her. Her eyes were all black, no whites of her eyes, no pupils. She stared coldly, devoid of emotion, and you could feel the evil radiating off of her. I remember as I made eye contact with her, I had the very distinct feeling that she was not human. I had a feeling that she was something evil in a human shell. I felt the most amount of terror and most threatened I have ever felt. I also felt like I was the food at the bottom of the food chain and I was her next meal. I definitely had a fight-or-flight response after I was able to pull my eyes away from hers. I remember thinking I had to get away and I had to protect my family. I tugged on my husband’s shirt and grabbed my son and started to pull them away. My husband asked why; I said we need to just go. I remember thinking it was very important that she didn’t know we were leaving because we were afraid of her. We went to the other side of the store (if we were smart we would have left immediately).